”Drive for show, putt for dough.” This old adage holds true for the P2. We dare to claim that the P2 has made the most dollars in prize money total. 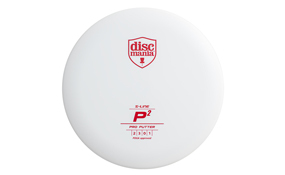 Several Discmania and Innova sponsored pros trust the P2 for the most important throw in the game. The P2 keeps popping up at the top of most sold charts, especially in putters, but also in all disc types combined. S-Line: Excellent grip in all weather conditions with great durability. This plastic ages well, which means that your disc doesn’t change drastically in it’s flight behavior after a couple of collisions with trees. Recommended plastic for drivers.